This is my Husbands Sister and her Husband. I love the rich colours and the ribbon looks great! I agree, those colours look fantastic! 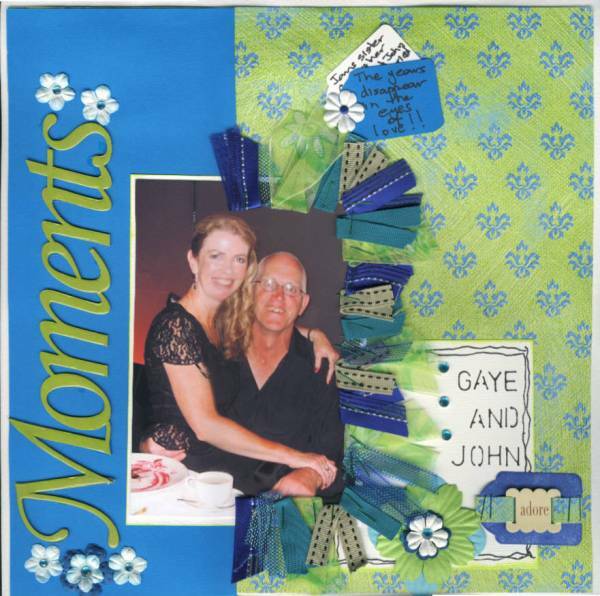 Love the way you have used the ribbon to frame the photo. Great LO. Love that ribbon - nice! That ribbon is just gorgeous!!! The few flowers, the tags, it's all gorgeous. What a gorgeous LO. I love the way you have used the ribbons also. Looks great. Love the ribbons!! The ribbon has worked so well,Lyndal, and I really love your little tag. Wow! Just adore the ribbon border! What a fantastic idea!